The manual says nothing about making a voice recording. 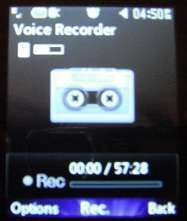 I see in the menu that a voice recording can be used as a ringtone but I can't figure out how to make one. and press the OK (center nav button) to record. 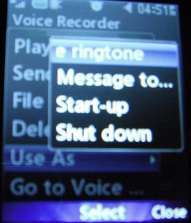 Options -> Use As -> Voice ringtone. You should get a "Saved" message. Now try calling the phone and see if it rings with your voice recording. BTW, I remember my visit to Oswego many years ago. As a geographically-challenged person, it was the first time visiting a new town that I could tell whether I was on the east or west side due to the river. Return to Tracfone LG 420g.